This is a somewhat famous barn in southeastern Oregon, in an area we like to call the state’s “outback”. It dates from the late 1800s, when Peter French, a cattleman from California, drove a herd from California into the open spaces of the Oregon Territory. His ranch eventually covered some 800 square miles! He became one of Oregon’s so-called cattle kings. He built a round barn so that his buckaroos (what cowboys are called in this country) could train horses while sheltered from the harsh high desert winters. The barn has been partly restored, but most of it is original. The beams are quite stout and the barn extremely well built, which is probably why it has stood up to the fierce winds and snow that hits this region every winter. It was long ago that I first visited this barn, and it was in much poorer shape then (though the structure was very sound). In recent years, money for its restoration has been made available, and a small visitor center/book store was built nearby. I photographed it at night and then again the next morning, with the light pouring in. On that quiet morning, with only the sound of the wind, I thought about the life here in the 19th century. The life of Peter French, his leadership, his drive to make it in this lonely outpost. The lives of the buckaroos, working hard every day, making just enough to get by, and occasionally being able to spend some of it in saloons. Were there ghosts roaming the hills still? I hope you enjoy the pictures, and also that your week is going well. Happy shooting! Part of the interior of cattle king Peter French’s round barn. You can see all the boards that have been replaced with recent restoration efforts. The clouds move in but don’t block out the stars over the French Round Barn. The night photo is simply fantastic. Thanks Imelda, I’m glad it turned out and that you liked it. It’s so nice to see that it has been restored. That night sky is amazing. Yes it sure is. I was worried about the star shot, because I’m using my laptop to edit photos right now. It’s screen isn’t the best. Thanks! Thank you so much for this beautiful look at the outback of Oregon, a place close to my heart and what I call my backyard. I LOVE round barns! 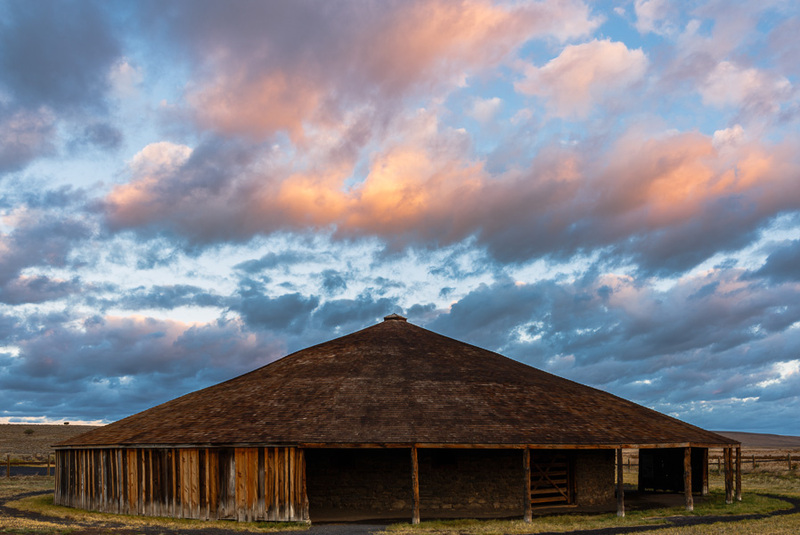 Have you seen the double decker round barn out in the plains of I think Wamic or is it Maupin….have just moved back from California and am excited to explore my home state extensively. Thank you Monica, and welcome back! I’m going to do another post on it too here. I love old buildings like that. It’s amazing how long they last. Yes it is! This one being of stone and tree beams resistant to rot is especially good. If they had access to cedar trees for roofing everything on it would be pristine. I am so loving your photos and information! I’m happy about that Annette! Very unique and such great photos. Beautiful pictures and interesting story. Thanks for sharing.